Since slide mailers are made out of chipboard, they’re super easy to cover using SU’s glue stick and DSP. For this particular slide mailer – I covered the front, back and inside cover with Dashing DSP. I used my old olive ink pad DTP method on the right side. 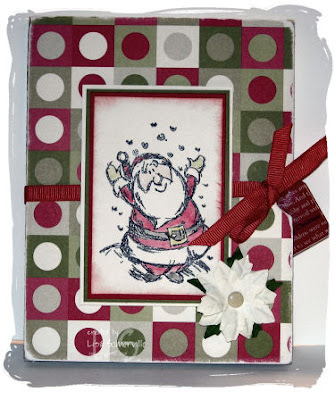 Stamp Santa image from Jolliest Time of the Year in black stazon, and color with watercolor crayons. 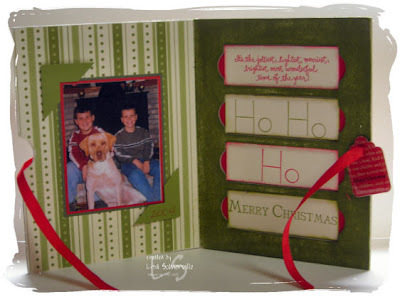 Sponge edges with red ink, layer onto red, olive then vanilla card stock, adhere to cover with dimensionals. Add paper poinsettia using a dimensional. To add contrast to the right hand side under the sentiments, I punched a ½ circle using my ¾” circle punch and red card stock and adhered them in place. Then stamped my sentiments on the vanilla card stock, sponged them and adhere them on top of my circles. I used my Crop-A-Dile to punch a hole on the right hand side, so that I could thread my red grosgrain, and add my chipboard charm. Layer photo on red, then artichoke card stock. Add old olive punched photo corners using a dimensional. :D Thanks for sharing, and for all the phenomenal projects you share with us!! !